When I first found out I was pregnant, the days seemed to crawl by. I wanted to be able to tell everyone. 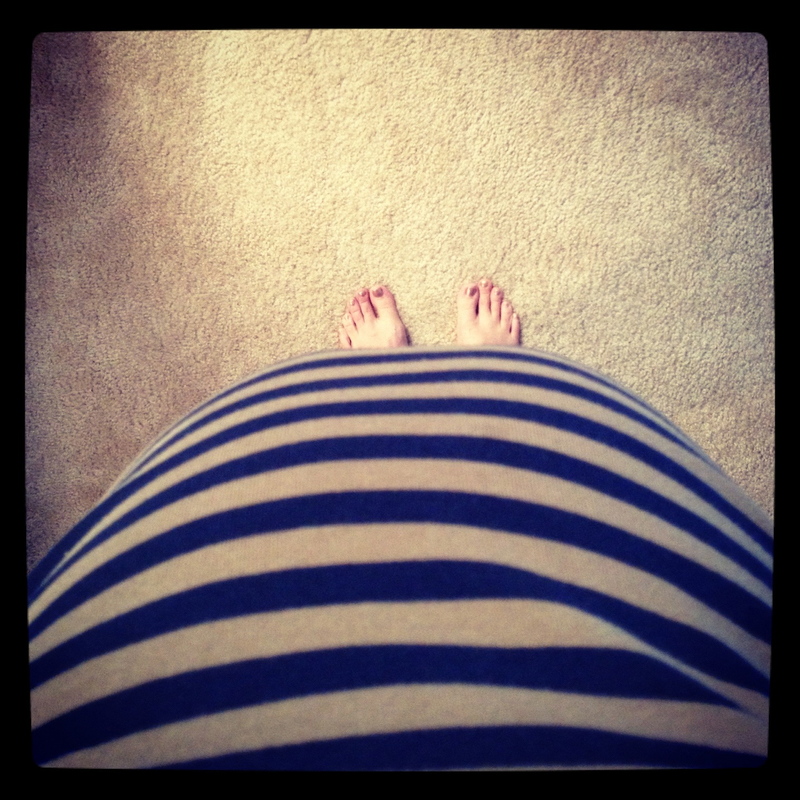 I wanted to be out of the risky first trimester. I wanted to have a reason to believe there was actually a life growing inside of me other than nausea and a weird sense of smell. Now, almost six months later, there is no question that there is someone living inside of me. While it may seem weird to some people, this is the part of having children that I always knew I wanted to experience (possibly more than actually raising them) – that of having a living being growing inside my body. I remember the first time I felt her. I was lying in bed with my hands pressed against my lower belly. I hadn’t felt the flutters or gas-like feelings that some people have, so I was trying to get a feel from the outside. I was anxious to know there was something in there and that all the weird changes were for a reason. It felt like someone quickly nudged their knuckle against my palm through a blanket. It was so exciting. And then I didn’t feel her again for a few weeks. Eventually I started to recognize the flutters. I’d try to get Jonathan to feel her, but she’d either stop moving or was too far inside. Then, after more weeks went by, I started to feel and then see more significant movements – kicks and rolls and then what felt like Mexican jumping beans. I imagined she was doing somersaults or synchronized swimming. One time when he was being silly Jonathan put his head on my belly and was promptly kicked in the face. As she continued to grow, I started to feel movements on one side and down past my belly button on the other – at the same time. She had long since stopped being the size of a fig or an avocado and was the size of a head of cauliflower. Then she was longer than Jonathan’s foot. She started to be the size of a baby. A baby that would one day grow to be an adult and possibly have babies of her own. That brought on a whole crazy thought process that I’ll share another time. Sometimes as I lie down with a book propped on my belly, it seems like she is trying to knock it off. Sometimes it looks like my belly is boiling. She fights against my waistband when I sit and doesn’t like the pressure of the seat belt. Even now, she is pushing on my forearm as it rests against my stomach. I wish I could see what she is doing in there that causes so much movement. For the last month or so, I can almost set my watch to her break dancing at 11pm. In the last week, I’ve noticed her movements are changing again. Occasionally she gets the hiccups and I feel the slight, rhythmic movement inside. Other times I look at my belly and am reminded of what we see when a whale surfaces just enough to show its back and then slides back under. Or, the dome of my stomach will be significantly higher and firmer on one side. I still get the swift punches and kicks, but there are a lot more slow “space is getting tighter in here” movements. I still can’t figure out what body part I’m seeing or feeling. And, it is as amazing as I always thought it would be. I’ve read that for some women it’s hard to adjust to having an empty uterus after the baby is born, and I am beginning to understand that. Right now, she is always there reminding me of her presence – when I’m cooking and my belly presses against the counter, when she doesn’t want to share my lap with another baby or a laptop, or even when I wake a little during the night. This time last year I was conquering my fear of motorbikes and getting ready for my first lunar new year. My current adventure might not photograph as well, but I think it’s just as wild a ride. You are so amazing, I know that beautiful baby will have an adoring mom who she can look up to…you are precious Grace! I know you will be a great MOM. Looking forward to seeing that little one soon =) Congrats! Aww, Grace! What a sweet, amazing post.